Get more information out by keeping the work in. 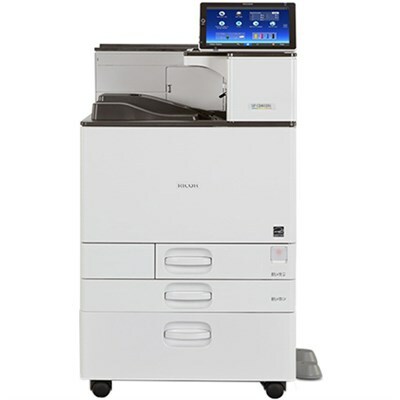 Use the SP C840DN Color Laser Printer to produce professional-quality color documents in-house and avoid outsourcing delays and costs. Produce up to 45 pages per minute (ppm); even in duplex mode; so your audience has critical information when they need it most. Reload paper and replace toner and drums in moments without technical assistance. Impress audiences with professional prints at up to 1200 x 1200 dpi resolution. Take advantage of our proprietary toner technology to produce postcards; brochures; labels and point-of-sale displays with clearer images in more brilliant colors. Preview your work on the touchscreen and make adjustments to avoid costly reruns. Make information more powerful by presenting it more ways. Use up to six paper sources to print personalized envelopes; banners up to 49.6" long; thick postcards; oversized booklets and more with speed and precision. Extend paper capacity to 4;700 sheets for longer runs. Add crop marks and color bars on SRA/12.6" prints for more precise proofing. Choose between multiple automated finishing options. Use the Internal Multi-Fold Unit to produce a variety of professional folding patterns; including tri-fold; A3 Z-fold and V-folds; to impress clients and reduce outsourcing costs. Simplify other tasks; including saddle-stitching; hole-punching and booklet-finishing. Add the optional 1;000-Sheet Hybrid Staple + Stapleless Finisher for any document set. Use the 4-Bin Mailbox to separate output. Avoid interruptions and delays with the Attention Light; which visually alerts you to changes in the printer status for prompt attention. Designed with our revolutionary Workstyle Innovation Technology; the 10.1" all-digital Smart Operation Panel simplifies everyday workflows; so you can use the same finger movements you use on your smartphone or tablet to access critical information and perform print tasks with ease. Choose from multiple user interfaces. Enhance productivity by downloading apps from the Ricoh Application Site. You can even create one-touch iconic workflow shortcuts. Use the Smart Operation Panel along with Ricoh or third-party workflow software solutions to simplify even your most complex print tasks. For example; you can choose RICOH Streamline NX to enhance document processes; or Nuance Output Manager to automate how you manage paper and electronic files. Download the RICOH Smart Device Connector app and print directly from your smartphone or tablet. Use your device or the printer's built-in web browser to access information from cloud applications such as Google Drive or Dropbox. Give visitors the freedom to print - with an optional; additional network port; you can assign guests to print securely from a secondary network. Take advantage of user authorization to track specific users and projects. Restrict access to color printing for only those who need it. Set print quotas. Add optional software such as Ricoh Device Manager NX Accounting for chargebacks. Simplify fleet management; including automated meter reads; with RICOH@Remote Office NX. Use Locked Print to hold prints until authorized users are ready to retrieve them. The SP C840DN is ENERGY STAR certified; meets EPEAT Gold criteria and offers Typical Electricity Consumption (TEC) of 1.7 kWh/week. Reduce costs even more with default duplex printing; and take advantage of Sleep Mode when the printer's not in use.